The Rogue Shorty Monster Bands are a 12" version of our standard 41" Rogue Monster Bands. These have the same color, width and thickness as our standard bands. This length is easier to setup and doesn't require the band to be doubled or tripled over pins or band pegs to get tension. Rated 5 out of 5 by lancefrek187 from im with the band these shorty monster bands by rogue are....awesome! i am so happy with these lil bands i just wanna share them with everyone i see at the gym...i wear them around my neck while i work out some days and take them off when i wanna stretch them or at home if i wanna do a tricept stretch or my back...i just love these..super conveneient and seriously effective pieces of equipment..they arent gonna snap in half the day you open them..its not a joke...theyre for real bands just the orange ones are little and look like a toy but arent...stable effective easy to find in orange and if the small ones are this good the bigger ones must be amazing! gotta have these! Rated 4 out of 5 by Kingbaldy from Mostly positive Bought pairs of the red, green and black shorty bands, all are really high quality bands. Use of nearly all of the bands has been positive, using the black bands for hip circles, green for work on the GHR and red for light warmups. However, on one of the green bands, the material is stripping away more and more as I keep using it. This started within the first couple of uses. It has gotten to the point where I am unable to use this single band as the extra material is tearing away from the band and is affecting the resistance of the band, decreasing with use. Other than that, all bands are great and highly useful, just seems like I got unlucky with this one. Rated 5 out of 5 by JustALifter from Strong So I bought a pair of the black 100lb short bands to deadlift with off band pegs. After using them, I've came to the conclusion that it's 100lbs per band, so 200lbs total resistance at the top which is perfect for me. These really help develope speed and power and I couldn't be happier. If you are looking at the black bands for deads, I recommend that you pull at least 450lbs, these little things are no joke! Rated 5 out of 5 by Moose from The real deal! I use these little beasts for my arm curls. I employ a hook which has a handle that I put my foot through. The hook allows for additional height that provides just te right amount of tension at rest (with arms down) and the perfect amount of resistance when doing the lift. These things are accurate too. 60 feels just like 60 as long as you are using them right. They seem durable enough to last. We'll soon see. Great for concentration curls too as well as chest expanders with a pair of hook/handles. Great price too. 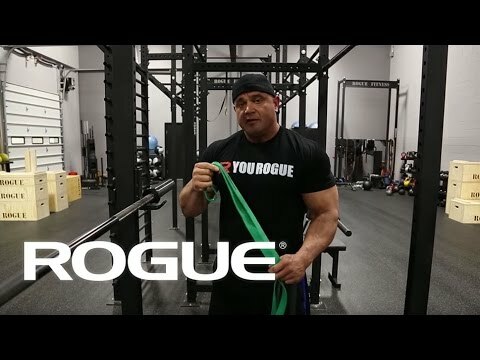 Rated 5 out of 5 by jyoung from great for muscle activation I bought the green and blue monster bands for my clients and personal use in our warmups. Used primarily for muscle activation drills, they have the perfect amount of tension and are very durable. A client of mine even ordered some because she liked them so much. Rated 5 out of 5 by Tara from New Love For These! I had no idea the kind of mobility exercises you could do with these bands. I am addicted! I bought the Black band which I love and is very versatile but I think I also need the Green and either the red or blue. Don't skim on these, go big and get 3 to start, you'll cover all the bases and save on shipping.